2013 Thrifty Santa Exchange Now Open! How addicted to thrifting board games are you? Found a box with about 200 cards for $1.98. Mostly 2011 stuff. It's been a really long time since I've done any thrifting at all, but I did manage to pick up a zipper folio version of this for $.99 this weekend at Salvation Army. It might be useful for Thrifty Santa. Also got some nice ties for Sam for $.99 and $1.99. Another Spot It in nice shape. I can always find a good home for these. Obtained for the nifty Halo bits. Complete. An incomplete Spot It with cards to offer those in need. Drop me a line if you are missing a card or two. Great day at the flea! First up, a very nice copy of Radar Search. 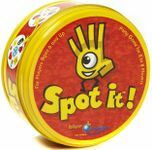 I had this game as a kid, and hearing the buzzer again was a blast from the past. Looks like this is complete and functional (although the buzzer doesn't always go off, you have to wiggle the keys a bit to get it to go). Three dollars at the flea (talked down from five). $5 for a box of DIY gaming goodness. McAlisters El Cajon. Edit: nothing like posting in the middle of a Bobpony dump to make you feel inadequate. Next up, a very nice copy of Dragonstones. Four dollars (talked down from five). I got to talking to the woman running this booth, and while we were talking a guy walked up with a little push cart - sticking out of the cart was an in-shrink copy of Lost Legends. I gulped, and said to her "Well, there's another guy that likes games!". I went over to him and started chatting, only to find that he picked the game up for five dollars from a corner of the flea I'd already visited. Well, almost visited. I got to the end of that particular aisle and had turned around before getting to the very last stall. Of course that's where Lost Legends was. I offered him ten dollars for it. He declined, he'd picked it up for his kids. Oh well! 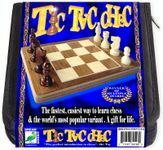 On the way I found a copy of this (the version in the small black plastic box). Looks to be mostly unpunched. One dollar! 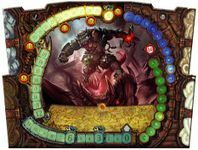 GEV also included this expansion. Free! I backtracked all the way to the corner booth that I'd missed, and sure enough, there was a small stack of games. On top of the stack, a shrink wrapped copy of this. 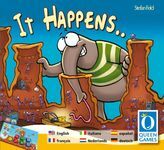 Stefan Feld? Dice? Wheee! I'm in, especially for four dollars. First time appearing on the thrift list. Who had that badge logo? 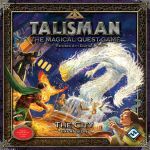 Under the anteater game was a very, very heavy box for Talisman The City. 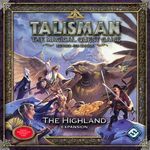 Of all of the expansions for Talisman, this is one of two that I didn't have. What are the odds? Scooped that up for another four dollars. Turns out it's missing the instructions and the figures, but everything else is there. First time appearing on the thrift list. Did I mention that the box was heavy? 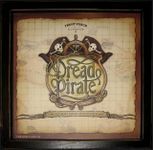 It included the cards, board, and character cards for this expansion. Free at the flea! Sadly no figures, instructions, or box. Yep, a heavy Talisman box. It included the cards and character cards for this expansion. Free at the flea! So heavy I could barely lift it! It included the cards character cards for this expansion. Free at the flea! There's more? How big is this box anyway? Sadly no figures, instructions, or box. And no dragon board either. 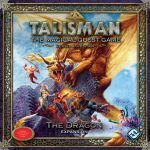 Yep, even more Talisman goodness. And one...more...expansion! 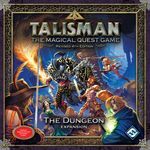 This was the other Talisman expansion I didn't own. Now to find figures for these. Now then. What's this underneath that heavy Talisman box? Complete for another four dollars. Winner winner chicken dinner! The box top on this copy is pretty ripped up though. Splits along two corners, one side, and then a bit more. Still not complaining! I'm calling this is a first time thrift for the list. The two previous entries were by me (FLGS deal) and someone else (Amazon deal). Neither was a thrift or anywhere near $4. So, I'm walking back towards the booth where I found Radar Search, dragging my haul of games along, and who do I run into? The guy that gave me the tip on where to find the games. 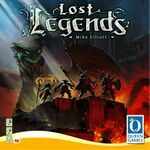 With that shrink copy of Lost Legends. He was happy that I'd found so many games to buy, and I thanked him again for showing me where to go. I looked down at Lost Legends in his cart. "I wasn't joking about buying that from you. I'd give you fifteen for it". "No, no. I couldn't. This is for my kids, I think they may like it". "It is a good game, but I'd love to have it. I could go as high as twenty". "Yep, I appreciate you pointing out the other games to me, I'd love to have this one too, and I'd give you twenty dollars". "Well, if you're serious. Ok!" In-shrink copy of Lost Legends, twenty dollars at the flea. First time on the thrift list...it just hit stores a couple of weeks ago! 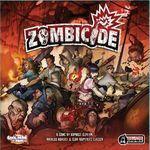 Guess what else was hiding inside the Zombicide box? So all told I spent forty dollars at the flea, but came home with a giant pile o' games and expansions - sixteen in total. So that's what, two and a half dollars each? They're weird, but they do work! I have a friend that's into cosplay that will probably love these. Only find of the day, Bakelite tiles! do they still make Bakelite? would have passed this by if I hadn't seen it on these boards - complete and unused, split in plastic inner tray. £3....all the games in charity shops are shooting up in price with the run up to xmas.. Even tough I promised myself I wouldn't thrift last week, I broke down and stopped at a few places over the weekend while running errands. Found this in a new thrift shop near the VV in Burnaby. $4.00 unpunched (is it rare to find a AH bookcase unpunched? ).